Lothar has long dreamed of riding some kind of bike from the front door of his house to as far south as roads go in South America. Millions of years of evolution channel me towards slower forms of travel. 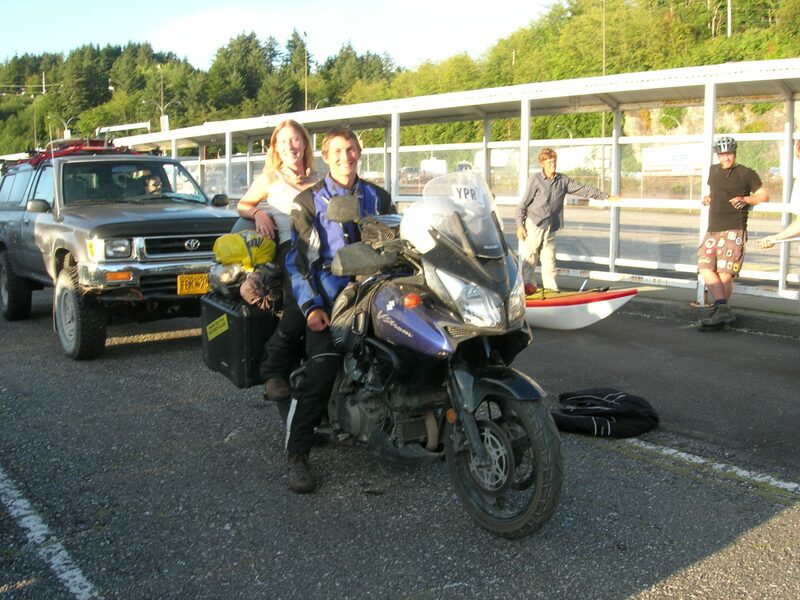 Our bike touring dream was set when we were standing in an Alaska Ferry line up with our tandem sea kayak in tow. 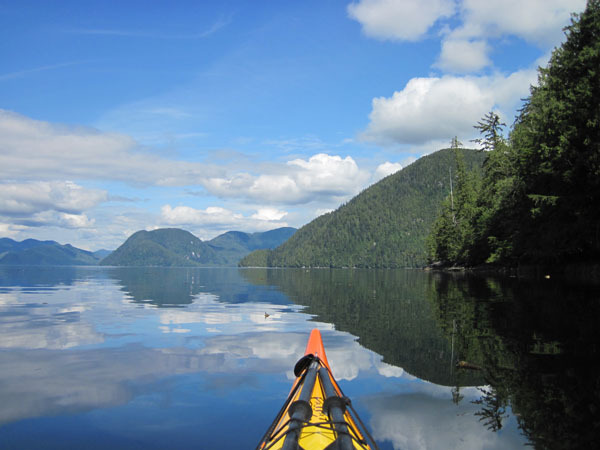 In 2007, the end our three-month sea kayaking adventure from Prince Rupert, British Columbia, to Glacier Bay, Alaska, merged with the beginning of other adventurers’ dreams. Tucked in amongst cars, trucks, and RVs were three young men with bicycles in front of us and a young couple on a motorcycle beside us. The kind of electricity that’s created when an adventure transitions into lifestyle flowed among us. Just as Lothar and I were coming to terms with the penultimate stage of our adventure, the other parties were settling into the rhythm of theirs. 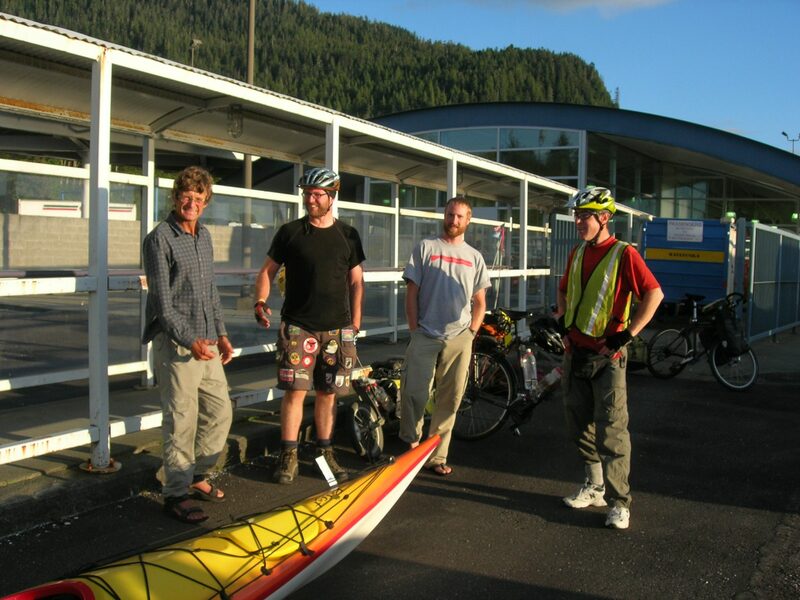 The cyclists were on a Pan-American tour starting in Dead Horse, Alaska, bound for Ushuaia, Argentina. Soon after we returned home, our friend Armell joined his brother for a leg of another Pan-American adventure, only these guys pedaled from south to north. The wheels of our imaginations were rolling. No doubt, many a stellar adventure has unfolded from relatively inexpensive and efficient access provided by the Alaska Marine Highway System. In Alaska, imagination is a commodity. Seems to me that plenty of people find innovative ways of turning their dreams into action without spending a lot of money. 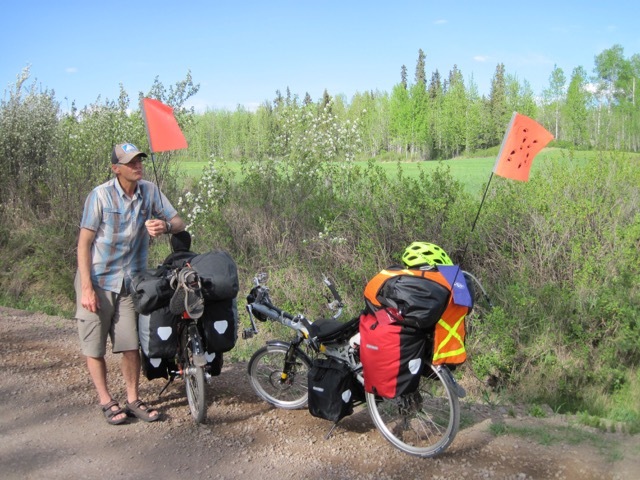 In 2014, we started planning a bike tour across Canada for the summer of 2015, as a test for our South America trip to see if we would “like” bike touring. Lothar’s brother and another friend of ours strongly recommended recumbent bikes for comfort-value amongst other assets. 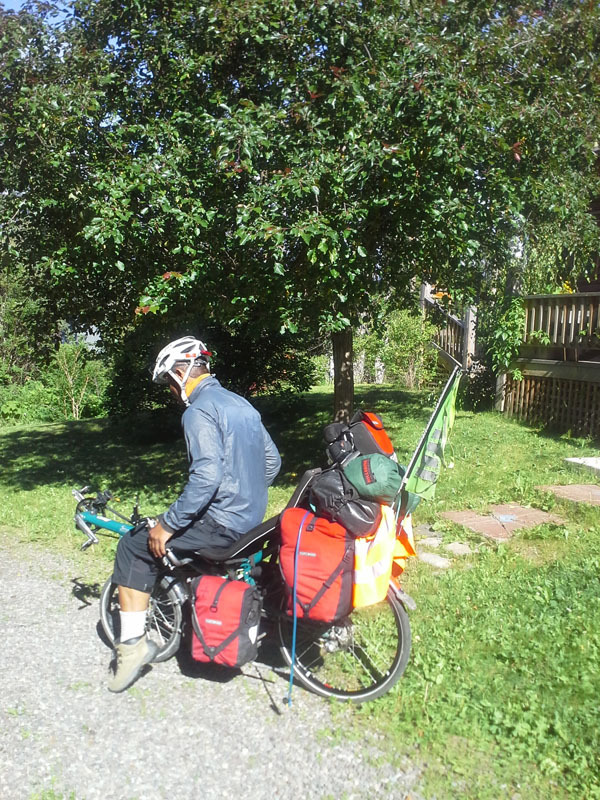 Based on previous bike touring experience, Lothar wasn’t keen to endure painful issues with various body parts that he knew would come with doing such a trip on a standard bike. The majority of my cycling experience consisted of riding around town on my little pink bike—also known as my pick-up truck—so I was short on opinions. With cycling as a lifestyle in mind, our internet research swung towards recumbent bikes. 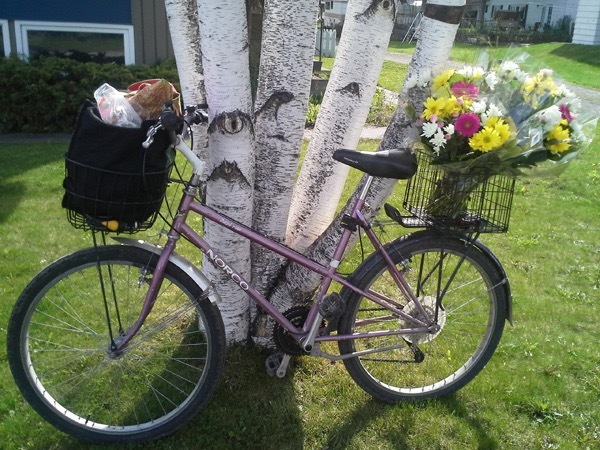 The first present that Lothar bought for me was my little pink bike, a garage sale special that I cherish to this day. As we were scoping gear and logistics for bike touring, a work colleague of Lothar’s and her husband, avid cyclists and recumbent bike connoisseurs, invited us for dinner to share their passion for and experience gained on long distance cycle tours. Brian and Teresa told us about the cyclists that they host each summer through Warm Showers. We left their home with plenty of inspiration and lots to think about. In short order, we signed up with Warm Showers to host cycle tourers too. Soon we had a series of cycling adventurers rolling through our place. We basked in their energy and enthusiasm, gleaned as much wisdom as we could about gear and logistics, and philosophized about cycling as a lifestyle. Our first guest, Mathew Hopkins, rolled in on an unconventional contraption, a HP Velotechnik Street Machine Gte. Lothar was captivated and attracted by the bike’s potential for providing a comfortable yet sporty ride. I was intrigued but didn’t even consider the bike as a potential option simply due to the fact that learning to ride it extended well beyond my perceived capabilities. Some things in life are best left to chance. When I got into researching recumbent bikes on the internet I was soon overwhelmed by jargon and acronyms. Plus there were far too many choices not to mention the range of variability in designs and associated reviews professing various pros and cons that to me were incomparable. The only choice that was clear to me was that I wanted a long wheel base (LWB) recumbent bike (a.k.a. bent bike) simply because virtual consensus appeared to be that they were easier to learn to ride than short wheel base (SWB) bent bikes. Check out Wikipedia for photos highlighting the spectrum of recumbent bicycles. Some people learn athletic endeavours by visualizing what they need to do and then they just get on with it. Lothar is in this league. He learned ski in deep powder by he refining his technique in a dream and then executing it the next day on the steeps, simple as that. Others of us learn incrementally, sometimes through trial and error or, preferably, with some guidance and support from experts skilled in helping others to build muscle memory: step 1, steps 1-2, steps 1-2-3, and so on. This is where I fit in. Regardless, figuring out what kind of bike to buy for Trans-Canada, Pan-America cycle touring seemed like an unruly hurdle. I couldn’t imagine riding a short wheel base recumbent bike even though Mathew made riding his HP Velotechnik Street Machine Gte look exhilarating yet practical and easy. 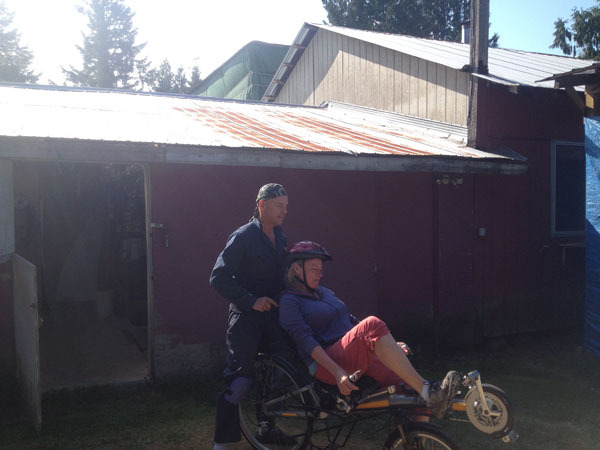 In late August, we made a trip to Vancouver to test ride all the models of recumbent bikes we could get access to. First, we stopped in Prince George so that Lothar could check out at a used HP Velotechnik Street Machine Gte that was for sale. He hopped on it and did a quick loop out the driveway: no problem. 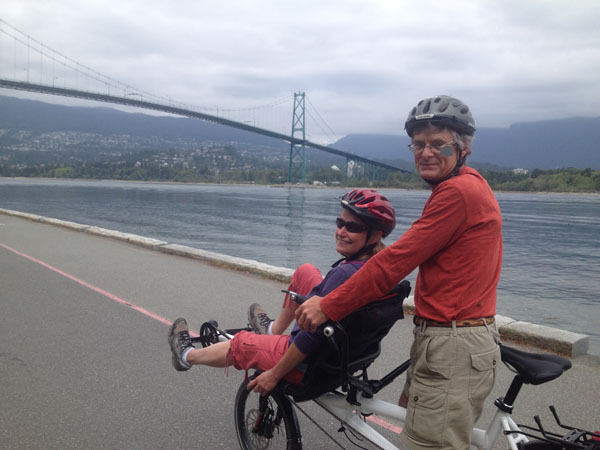 When we got to Vancouver, we took a couple of models of long wheel based bikes that Cambie Cycles had in stock for test drives. With wobbly take-offs, I managed to make my way around side streets and through parks without crashing into anyone or anything. The next day we returned to the shop to rent a Hase Pino SR Compact Tandem bike. We had a hoot riding it down Cambie Street and then on to do a big loop that included the False Creek and Stanley Park seawalls, mostly on walking/cycling paths. We took turns as driver and stoker. True to character, Lothar was much bolder than I. The crux for me was when he insisted that I launch us down a steep lawn with the assumption that I would be able to execute a right angle turn onto the trail that we wanted to be on without plastering the two of us onto the seawall. Do you know someone looking for something adventurous to do on a date in Vancouver? I recommend renting the Hase tandem bike from Cambie Cycles to test drive a relationship. Ogling tourists combined with pair bonding belly laughs are pretty much guaranteed. In my mind, there is no comparison between tandem bikes and tandem sea kayaks. Friends of ours, and even Lothar at one point, suggested that we get a tandem bike. For them it seemed natural that we would make the transition from tandem kayak to tandem bike. Sure a tandem bike is great fun for a day but in my mind there’s simply no comparison. 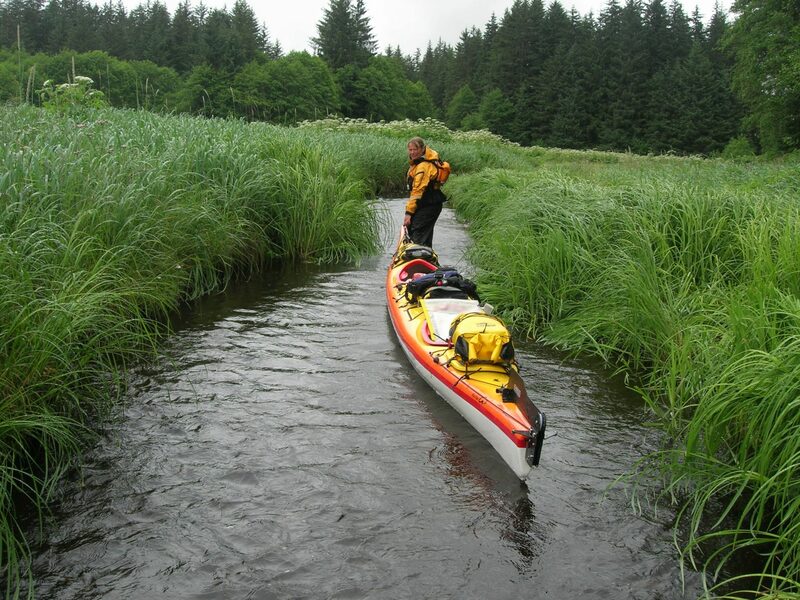 I cherish the months that Lothar and I have spent together in a double kayak. But I can’t even fathom doing a long distance tour with him on a tandem bike. Just thinking about charging down hills and through traffic on a bike under Lothar’s control gives me goosebumps, even if it’s only a half time arrangement. I’m sure that being subjected to some of my needs and sensibilities on a bike would be torture for him too. No gas needed to have a gas in Vancouver. 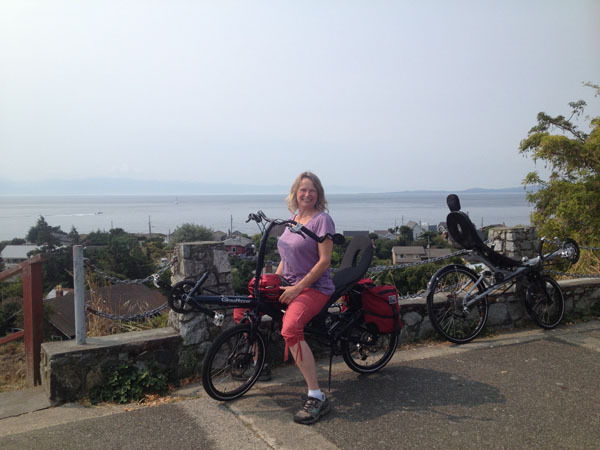 Instead, we rented a tandem recumbent bike from Cambie Cycle and rode along the seawall paths of Vancouver. Next we headed to Fairfield Bicycle in Victoria where they had a Streetmachine Gte and a Grasshopper, both HP Velotechnik recumbent bikes, in stock. The Street Machine is outfitted with a 20″ front wheel and a 26″ rear wheel, whereas, both wheels on the Grasshopper are 20″. These particular bikes had below seat steering on the Streetmachine and above seat steering on the Grasshopper. I hopped onto the Grasshopper. Finally, I found the bike for me. Despite the short wheel base, not only could I ride it but I could almost imagine feeling comfortable and confident riding it. I suspect having put in a bit of training time on the long wheel base bikes helped me with the learning curve on this bike. We had one more bike shop to visit so I decided to wait until the next day before finalizing my decision to buy the Grasshopper. That evening a friend of Lothar’s saw his posts about our bike shopping on Facebook. He sent a message that a friend, Matt, in Duncan was selling a used HP Velotechnik Street Machine, the same model as the bike in Prince George that Lothar had pretty much decided he was going to buy. As Lothar’s luck or my fate would have it, the next destination on our list was to visit my parents in Duncan. So off we went for a homecoming followed up with a side trip to Matt’s to finally face the bike I’d been avoiding. In short order, I bonded with the HP Velotechnik Grasshopper that I took for a test ride in Victoria. That’s a HP Velotechnik Streetmachine, much like the one Lothar had his eyes on the right. Like it or not, I needed to shift gears. We arrived at Matt’s place to find a well-kept recumbent bike. Lothar didn’t need to say a word. I could just tell he was keen for me to choose this bike. Despite my inability to envision riding it, the rationale for having interchangeable parts between bikes was obvious. With Matt providing launch support, I tentatively rolled down the gentle driveway leaving the guys behind to visit. From the gate, I headed out onto a hilly country road. I interspersed a 15 minute walk with short rides whenever I could work up the courage to get back on the bike. When the chain fell off, I walked the bike back to Matt’s. Apparently, my gear shifting skills were severely limited. As I walked up the driveway, I envisioned being on a rough road somewhere in the middle of nowhere where Lothar’s could keep his Streetmachine rolling as I floundered behind on my Grasshopper. That’s when I let go of the bike that felt right to me for the one that I could tell Lothar wanted me to get. My decision was underscored by Matt’s assurance that the HP Velotechnik Streetmachine Gte would be suitable for the bike touring adventures we envisioned. And knowing that Mathew, a professional wheel builder, was out there testing the same model, a year and many kilometres ahead of us, and reading his blog the Road of Little Miracles also helped a lot. Somehow, I’d learn to ride this new bike of mine. As we were heading down the driveway, I asked Matt what her name was. “Gucci”, he replied. When I got home, I renamed my bike Cricket with the hopes that she and Matt wouldn’t mind, and more importantly that I wouldn’t regret forgoing the Grasshopper, the bike that felt just right to me. I followed up my test ride (but mostly walk) of Matt’s HP Velotechnik Streetmachine Gte with a leap of faith, buying the bike that would soon become a defining feature in a major shift of my lifestyle. But that was assuming I could learn how to ride it! 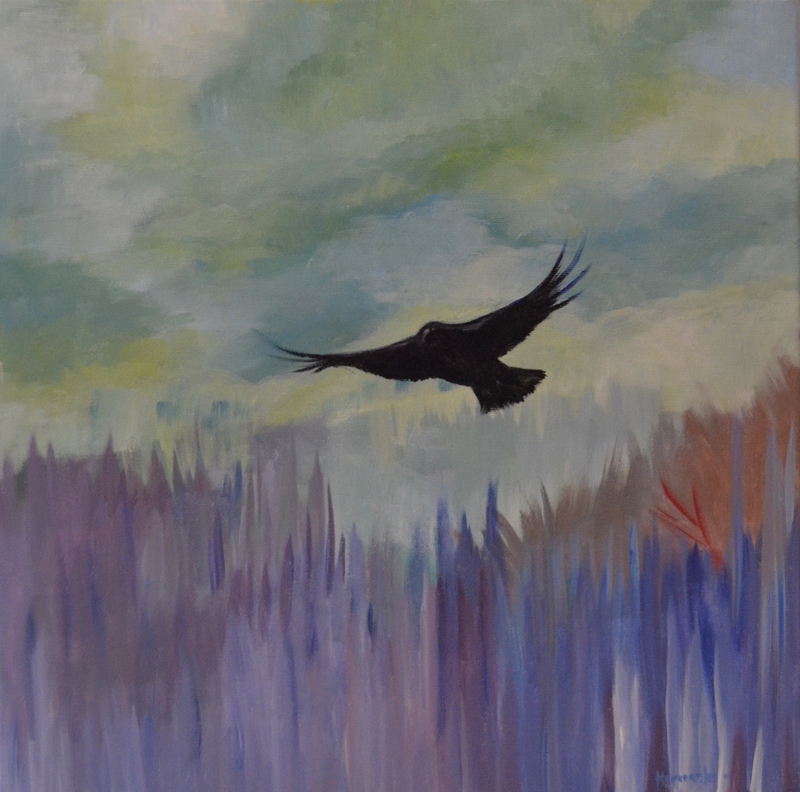 On 8 June 2015, Lothar and I launched into our trip across Canada (in progress). If we’re still enjoying ourselves when we get to Newfoundland, the plan is to turn right and carry on. Stay posted for updates. If you subscribe to my blog, you’ll get an email when I submit new posts about our travels. I’ll be writing en-route. So sorry I missed you when you were here! Have a wonderful trip. Me too, Megan! Maybe you can catch up with us down south (?). 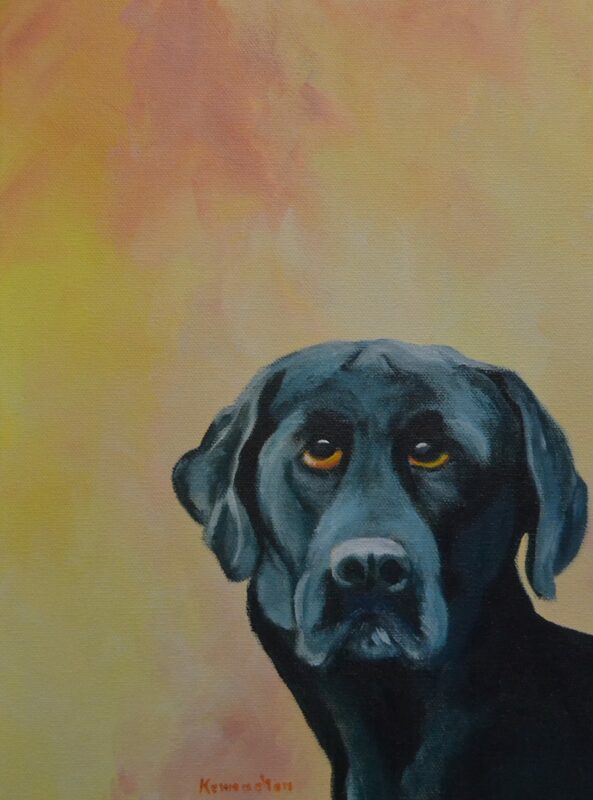 Good stuff Deb , I’ll bet even your grocery list would be interesting to read the way you write … “) Keep us posted ! Thanks Rob! Maybe I should post my to-do-list…Happy Canada Day. It was great meeting you on Manitulin. I hope you and Lothar where able to find shelter on Monday with all the storms . We drove home to Eagle ont. all day in the rain. Hi Colleen and Doug, Believe it or not we rode through all that rain. It wasn’t too bad. That’s three days of rain in 2 months of pedalling…pretty dry compared to what we are used to. The roads were busy but drivers gave us lots of space…not at all like the scary rat race on Highway 17 east of Sault Ste. Marie. As soon as we could, we headed for roads along the shoreline of Georgian Bay. Hard to believe that such a beautiful route was so quiet. Quite the contrast! Great to meet you two and too…it’s the people that we meet that are making our adventure the stellar experience that it is. 🙂 Best wishes! Hi Taoya, It sounds like quite the summer out west. We finally pedaled out of a two month heat wave two days west of Sault Ste. Marie. I’m loving the cool air and sunshine in southern Ontario. Definitely not what I anticipated given past experiences with Ontario sweltering hot, humid summers. I’m learning lots of new things including…bike touring is busy…but I’ve got more posts in progress that should be out soon. Heading for Niagara Falls today. More soon. Best wishes. So nice to meet you folks today! Annabelle really enjoyed your visit and trip to cemetery in Center Rawdon.